Is this Jose Mourinho's replacement at Man Utd? Is this Jose Mourinho’s replacement at Man Utd? Jose Mourinho’s future at Manchester United has come under question this week following our disappointing Champions League exit at the hands of Sevilla on Tuesday. We offered little threat over both legs whilst allowing a total of 46 efforts on our goal over 180 minutes against the team most consider the weakest in the final eight. On top of this we are 16 points behind Premier League leaders Manchester City. This all comes after the Portuguese coach has spent around £330 million in little more than a season-and-a-half. The future of Jose at Old Trafford is now under question by many and Spanish outlet Don Balon are claiming they know who his replacement at Manchester United will be. 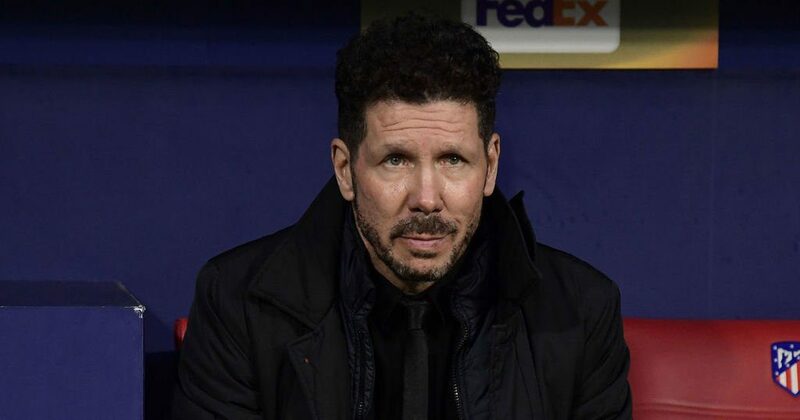 Don Balon are claiming that Atletico Madrid manager Diego Simeone will replace Mourinho at Old Trafford. The Argentine is highly-rated having won the 2013-14 La Liga title as huge underdogs and taking Madrid’s second team to two Champions League finals over the past four years. Simeone is a quality tactician who has previously been linked to the likes of Internazionale and Chelsea. He has a reputation of signing quality strikers and developing players. Whilst Jose Mourinho’s tactics have been ultra defensive this season, Simeone has shown his versatility in charge of the La Liga side in attacking sides when needed. Is Jose any better than Van Gaal.Started off ok but my God is it boring now.No attacking consistency. Is Jose any better than Van Gaal. Started off ok but my God is it boring now. No attacking consistency. If you have to answer that question to someone they are not a Manchester United fan or supporter. The best possible option would be to endeavour to lure Guardiola away from Man City but I guess that’s not going to happen. The next best scenario would be to drag Sir Alex out of retirement begging him to restore the Club to its rightful place – top of the pile even if only for a couple of years until a suitable gaffer can be found. Perhaps the youthful Liepzig manager? Steve Bruce with Roy Keane or Martin o Neill they will get united going again by playing youth look at the history of united policy Sir matt busby Tommy Docherty and of course Sir Alex they all played young lads with say bout 3 or 4 experience players in there teams , now do you call Pogba experienced ??? and what about Sanchez oh my god my old granny could dribble and pass the ball better than im !!!!! Martin o.neill my god are you on something youve gotta be jokeing.and sorry other2 were man u legends but prem managers not a chance.at this moment i dont believe there is a manager out there for utd wholl play the attacking football good enough for utd.i think u after look at woodward moyes van gall mourinho all same negative must not lose tactics boring to watch. and pristle your defending then tell me who you will play and attack, please the answer is massimiliano alegri or Erice Luis. we can’t continue with Jose period. The major problem with man u is Jose himself. He doesn’t understand modern football. Bring back Sir Alex please even next year it will be same stories of buying new players. Big mistake letting Pep go to city. Let pray city sack him and we get him. Jose is boring and would kill United. Sack him plsssssssss. Jose is just too arrogant nd I hate it when he critsizes players in the media he need to go like yesterday, he is nt manu material at all,Gigs would hv been the one. Jose Never Now’s The Manchester Utd Game, He Have Gd Players, But To Manage Them Is A Problem To Him. jose is only thinking of buying buying,we want amanager who respect players.plan te game.lastly he said “iwas happy” for te loss. I think since sir Alex Ferguson retired, utd did something stupid by appointing a mid table manager to manage a big club. moyes sacked all the staffs, bringing his own inexperienced backroom aids. that was the the start of the problem we’re experiencing now. Again woodward squared past mistake by appointing lvg, he killed everything. boring football, selling some players, playing players wrong positions,, etc. Jose came, we all saw glimpses of improvement, but surely currently all is getting worse. the right manager to bring something nice non other than pep but under board supportive, city supports him, anything he wants is just on table. If not pep then let’s bring back saf to bring stability as we wait for someon capable. Been a utd supporter over 40yrs. This last few months I’ve seen some good football some slow boring football and some mediocre football, when we zip the ball around we win when we side pass back pass and take forever to attack we lose. Why does jose buy good players then play them out of position? And why do we rely on players 30+ , bring some of the younger no fear players into the squad and give them a chance. Please bring Mauriocio Pochettino to manage Man U. Head beat Real Madrid home and away. At Southampton and Tottenham his records are clear. Yah I free with many that Jose has not done and may not do what it takes to restore Man-u’s image. If a manager only admires and buys players 29yrs and above, only has a defencive game plan, has so far spent 330m pounds but 16pts behind man city. I don’t remember when we last lost a round of 16 UCL match at old Trafford. Shall we have to give away another 330m pounds to be PL championship. No, it time Jose left, thx. my expextaion is Jose to leave old Trafford bcos he know the players that we wing but he can not pic them to the squad. I would rather have this kind of score & rubish tacktics with young coach from clug legends! personally, mourinho is not a coatch & not amanager! He is looser & money spender with out considering returns! Manutd is not a team for short minded coach like mourinho who dont hear advices from club funs & legends! See all his recruitments no one can help the team to move from where it is to next level! How club can loose Ferdinand,vidic,Evra,Ryan Gigs followed by Paul skoles & replace them with Lendelof at the back!can sanchez at 29 yrs replace Gigs! till now both Right & Left wings of united not wirking not becouse we dont have players but becouse of mourinho accient so called tacktics! In brief! blame is on manutd board who didnt plan after Furgason who shall take over the team! Mourinho is adisaster in united & dont expect any thing good apart from being extravagancy in his recruits! Mourinho is mourinho…….club need patience…he will do for MANu.definitely u can c,next premier league&uefa champion it’s for MANu….he is the special one…mourinho u can do it……..
Let us bring the class of 92 in the names of Scholes , Giggsy, G. Nevile and Beckham but mourinoh z just a crump. If Alex Ferguson is not available to manage Manchester United. I would prefer we call Ryan Giggs to continue the legacy of Sir Alex Ferguson. when pep came to England,same people praising him now were mocking him then,Jose is trying to make this team strong after moyes n van gal weakened it..its a processes n we are almost there. united game has changed coz of jose I think it’s high time to go forward ad less do something before it’s to late.